Egg Sitter® Support Cushion | Official Site | The Astonishingly Comfortable Cushion! Say Goodbye To Achy Muscles & A Stiff Back Caused By Sitting! Egg Sitter® Support Cushion allows you to sit on the hardest of surfaces all day and still feel comfortable. Cushion collapses in on itself to absorb pressure points, alleviating pain. What do you get when you cross your tired, achy back with a fragile egg? The new Egg Sitter® Support Cushion! It supports your backside and spine so well that you can sit on an egg without breaking it. READ FULL DESCRIPTION Say goodbye to sore muscles from sitting all day or a stiff back from long car rides. The Egg Sitter® Support Cushion allows you to sit all day in the hardest chair and still feel comfortable. Other support cushions need a gap in the center to cradle the tailbone. Not Egg Sitter®. Its honeycomb design is made of ultra-flex polymer. Egg Sitter® Support Cushion collapses in on itself to absorb pressure points. The flex grid stays cool to the touch and allows air to circulate underneath. You'll get optimal lumbar support when you sit on Egg Sitter® Support Cushion. Super strong and durable, it always restores its shape! It's perfect for use at home, in the car, and at the office. Egg Sitter® Support Cushion includes a free non-slip washable cover. Stop sitting in pain and get an Egg Sitter™ Support Cushion today. Get the Egg Sitter™ Support Cushion for only $39.99 plus shipping and handling. We'll include the non-slip Slip Cover at no additional cost. But wait - double your order to receive a second Egg Sitter™ Support Cushion. Just pay a separate fee. 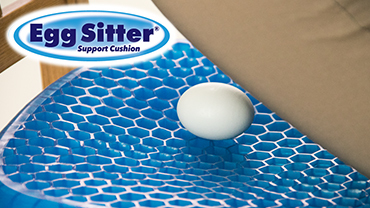 Egg Sitter® Support Cushion Is Made Of Ultra-Flex Polymer, Making It Strong & Durable. Check out these other great products by Egg Sitter® Support Cushion. Get the Egg Sitter Support Cushion for only $39.99 and $5 shipping and handling. We'll also include the non-slip Slip Cover at no additional cost. But wait - we'll double your order and send you a second Egg Sitter Support Cushion for just a separate $19.99 fee! You can also upgrade your Egg Sitter to the deluxe edition which includes an odor resistant, bamboo cover infused with charcoal. Just pay $74.98.